The truth. I don’t like chocolate ice cream. Chips I could abide, sure. I liked the lurid green of a mint chocolate chip as much as the next child of the 80’s. But chocolate ice cream has categorically left me cold my entire life. Until now. It always seemed both a disservice to chocolate and to ice cream. But then I discovered the secret to making a chocolate ice cream worthy of the word chocolate and all its complexity. Can I just do that thing where I proclaim this the Best Chocolate Ice Cream Ever? It involves Lindt chocolate, ganache, and chocolate custard. All at once. In short: you make a ganache out of a Lindt EXCELLENCE 70% Cocoa bar and chocolate custard out of the best cocoa powder you can afford. And then you mix it. And freeze it. 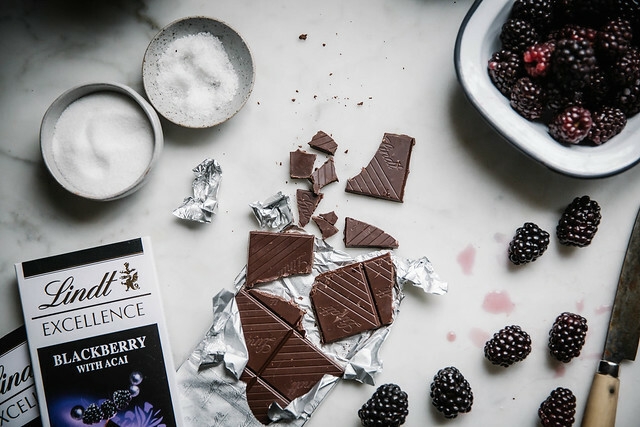 And then throw in the best thing ever: broken up “chips” of the new Lindt EXCELLENCE Blackberry with Acai bar which has the perfect combination of silky dark chocolate with pieces of sweet blackberry and tangy acai berry. Add a swirl of blackberry syrup. And you’re done with all other chocolate ice cream ever. Could it live without the blackberry? Sure. Make this with or without it. You’ll have no regrets either way. But I find the tart foil to the richness of the chocolate to be deal making, breaking, killing it awesome. I wouldn’t skip it unless berries were out of season and I ran out of my frozen supplies. 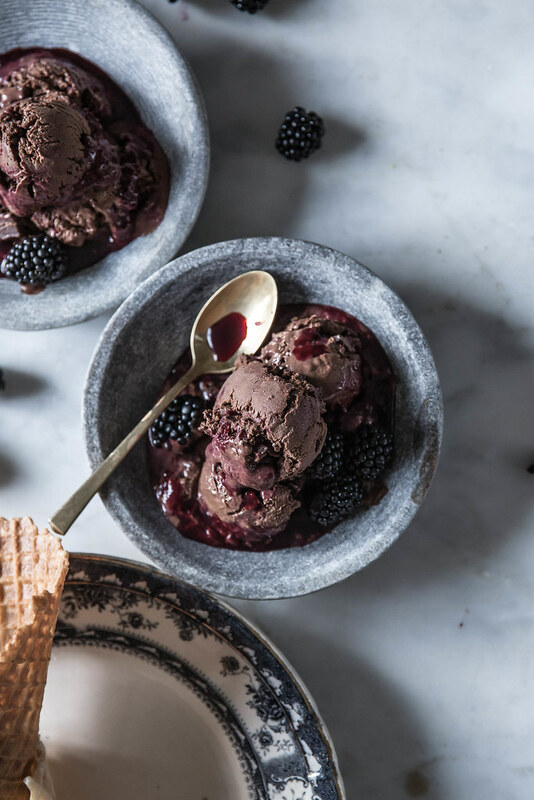 If brownie batter, if truffle, if all that is holy and chocolate was ice cream, it would be this. I stand behind this with every fiber of my chocolate loving yet simultaneously chocolate ice cream disdaining being: it is a game changer. Privilege richness. Don’t compromise. Is making ice cream from scratch more time consuming than buying? Yes. Definitely, categorically, yes. But. It’s worth it. So, before the heat lets up, make some chocolate ice cream that actually tastes like chocolate. Heat 200 mL of the heavy cream until just about to boil but not boiling and pour over the chopped 70% dark chocolate. Let sit for three minutes. Stir until the ganache is completely smooth. Set aside while you make the custard. In the bowl of a stand mixer beat the egg yolks with 100 grams (1/2 cup) of the sugar until very pale and thick ribbons form. 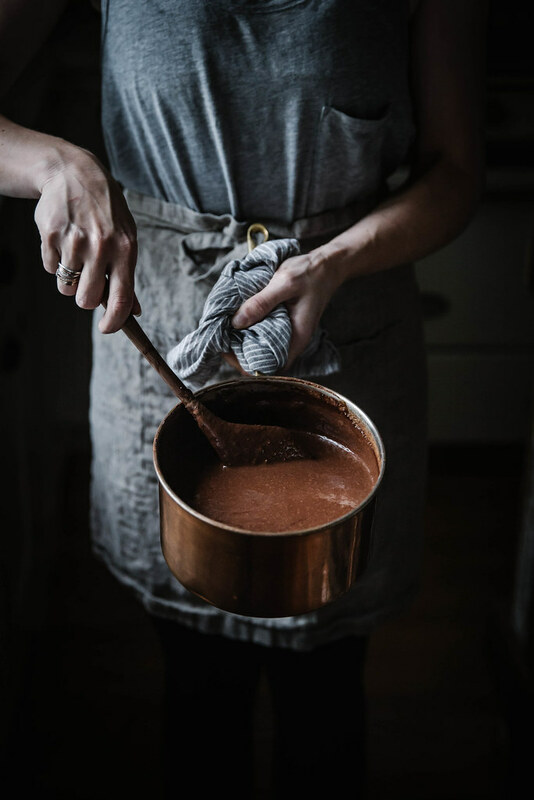 Meanwhile whisk the cocoa powder in to the whole milk and the additional 40 mL heavy cream and heat over medium until hot. Once hot (but not boiling), slowly pour into the egg mixture with the mixer running on med-low to temper the egg. 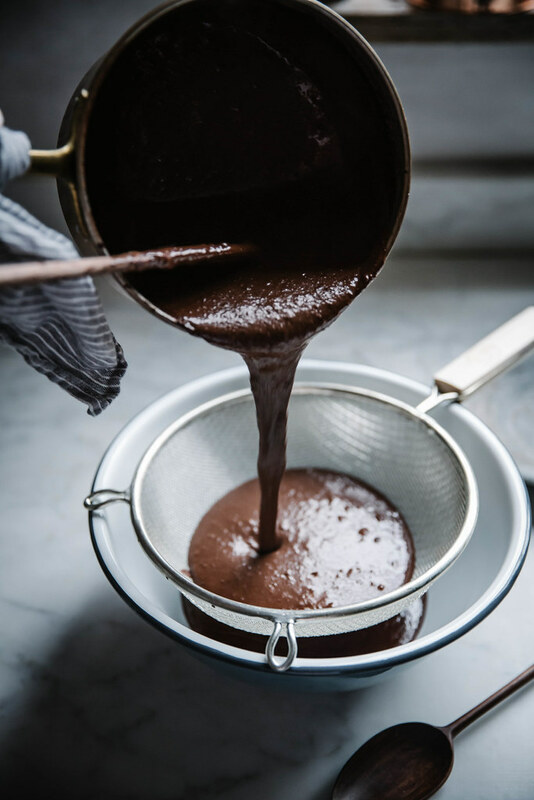 Return this custard mixture to the pot, whisk in the ganache mixture, and cook on medium/medium-high until thickened and it reaches at least 175°F. Remove from heat, strain, and then whisk in the teaspoon of salt (or salt to taste, I like mine a bit saltier). Chill this covered in the fridge for at least four hours or over night. Meanwhile make the blackberry syrup. Puree the blackberries in a blender. Strain (you should have about 1 cup of juice). Place this in a sauce pan with the additional 50 grams of sugar and the vinegar. Cook until reduced by half. Chill in the fridge until ready to use. When ready to churn, churn the chocolate base in an ice cream maker according to the manufacturers instructions. 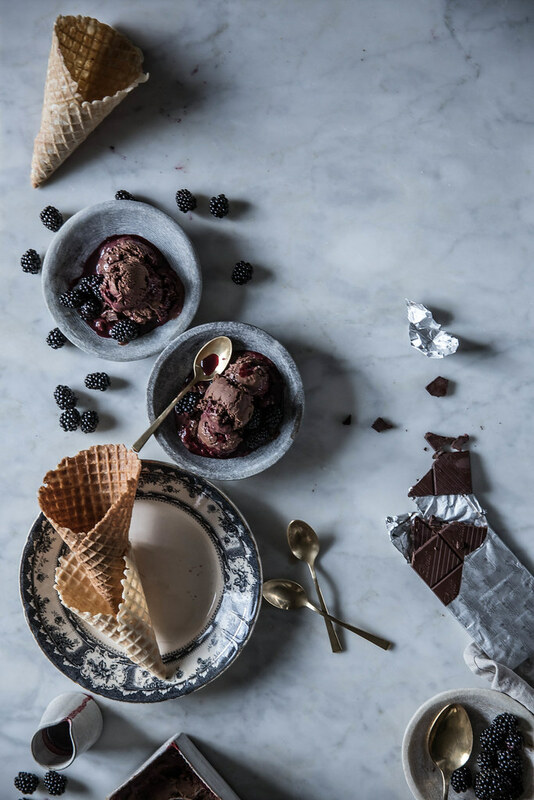 When the ice cream is done, Stir in the chocolate chips and layer it with the blackberry syrup. Cover tightly with plastic and place in the freezer. Allow to set out and soften for about 10-15 minutes before serving. 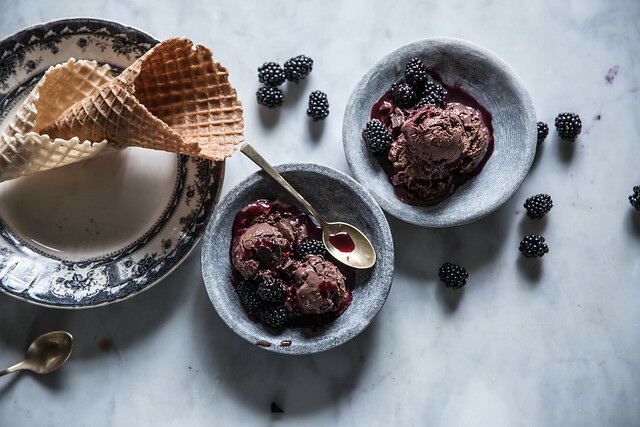 Oh, be still my chocolate-and-blackberry-loving heart. LOVE. This is absolutely beautiful. The Lindt 70% bar is one of my faves. This is a must make! P. S. I’ve never been crazy about chocolate ice cream. Until now? What a treat! The presentation is impressive. 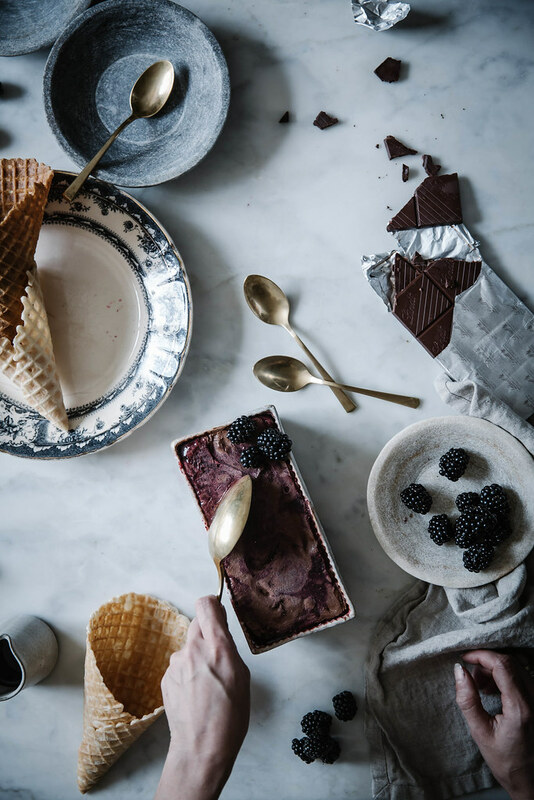 I love chocolate ice-cream and always look for a way to add extras that will suit well. I had a bad experience with mint, but that is all in the past. May I add that you’re very good with the camera. The photos look like they are for a magazine. awesome post there. keep posting !!! Oh my, it looks amazing! Your pictures are so beatiful, and the recipe seems to be excelent! I will sure try this, specially because of the ingredients, with no artificial flavours! Just onde question, since I dont have one, can I skip the ice cream machine step? Will it change a lot in consistency? I can speak to how that will turn out because I’ve never tried it. It will definitely change the consistency because it won’t be churned. But it could still be good! I love the pairing of chocolate and blackberry. This ice cream looks like the stuff of sweet dreams. 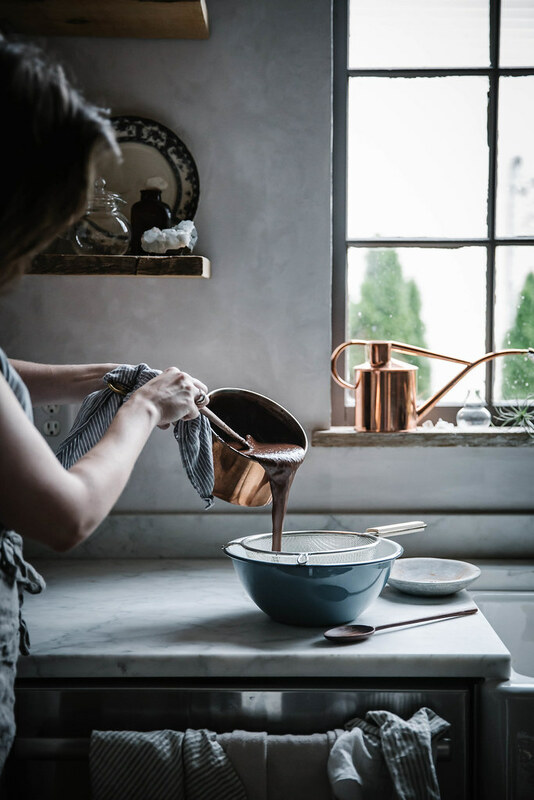 I am always looking to explore different brands of chocolate suited for cooking and baking. Any additional chocolate/cocoa powder recommendations? This is divine. I’ve never been a big chocolate ice cream fan either and you just made me realize why. I am a huge chocolate fan. The darker the better. Thanks to you, I now know how to enjoy my chocolate in ice cream form. Photos are amazing. Thank goodness you hopped on the chocolate ice cream wagon!! Because this one is perfection. Love the blackberries in there! This looks absolutely incredible. I am with you on the chocolate ice cream, it’s usually so disappointing. But this… This is everything. Your photography is stunning, as always. That photo of the three waffle cones! I’ll be dreaming of those cones for the rest of my life. Your blog and post are awesome!!! I enjoy reading every of your posts! I love the photos as well!! You are incredible! Thanks for sharing all these! Have a nice day! Same with the chocolate ice cream. Have never liked it, although I love chocolate 🙂 This looks amazing though. And btw, I arrived here from your Instagram. Just gorgeous photos. This sounds like the most deliciously, ridiculously, obscenely decadent chocolate ice cream I could ever imagine. 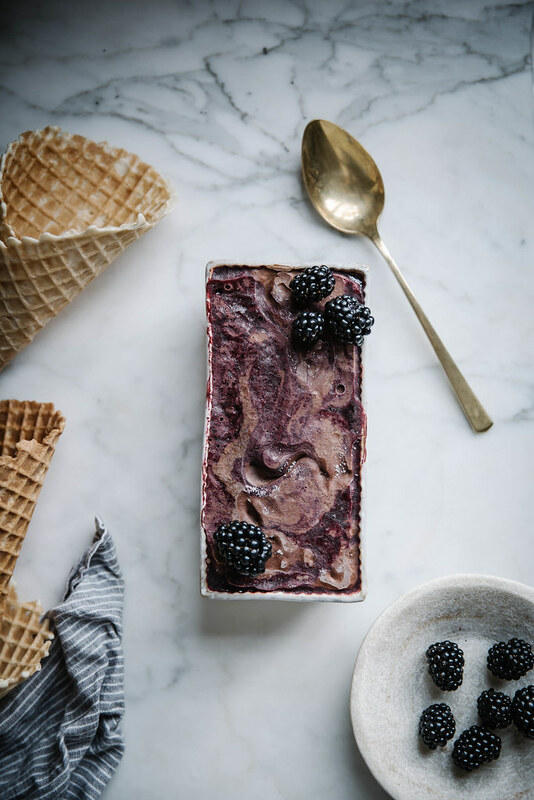 And those blackberries look gorgeous and sound like they would add just the pop of acidity and freshness I would need to have another bite…and another…and another. Hah! I feel the same exact way about chocolate ice cream but could never find the exact words. Thank you, lol. This looks so interesting and like one of those “i gotta try itttttttt or i’ll explode” flavors. Your photos are amazng, they really make me feel like I’m in some peaceful place. Great recipe as well. 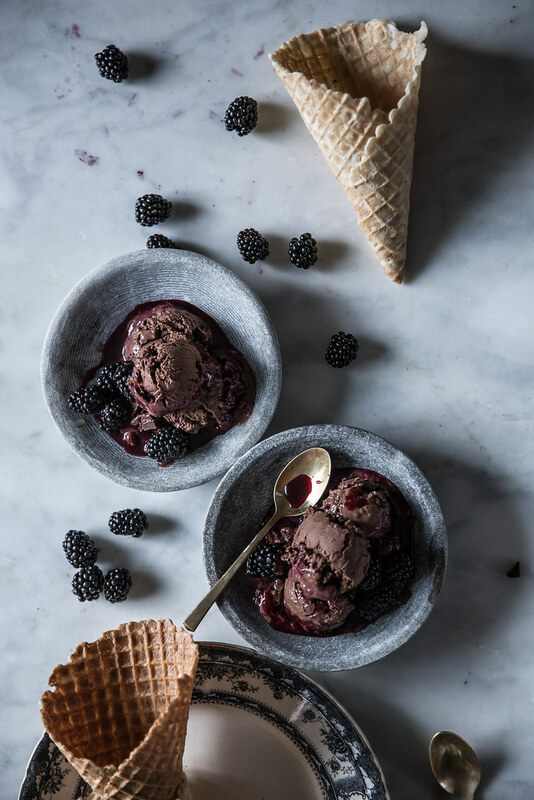 It looks amaizing, I recently had a forest berry and dark chocolate ice cream in some ice cream place and I wanted to be able to make it at home, yours looks like a perfect place to start. This is gorgeous. 100% A+++++ genius. 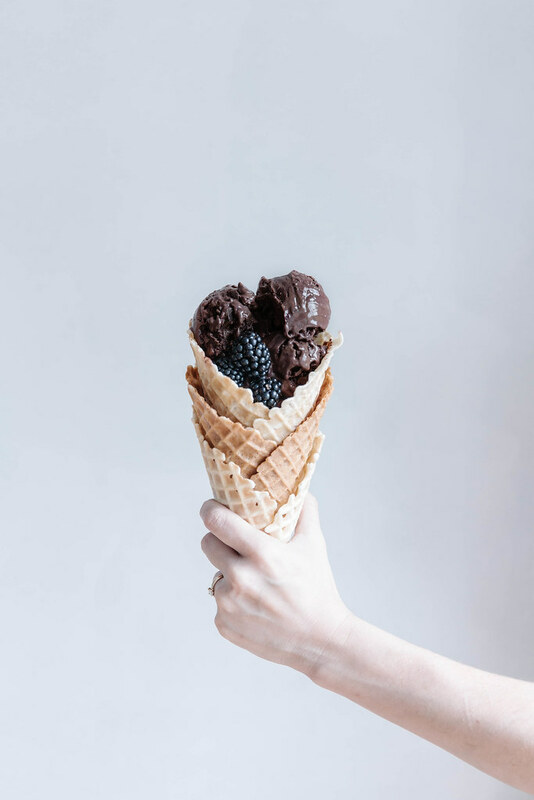 You had me at blackberries and chocolate ganache. Be still my heart! THIS is chocolate ice cream! oh my gosh! i can’t believe i only found your beautiful blog now!! your recipe, your website and your photography are brilliant! well done and keep up the great work! That chocolate made my mouth water. And I LOVE your pictures. I feel like I can taste the ice cream just by looking at them! Absolutely veganize it. It looks spectacular but all that saturated fatty animal milk killed it for me. This is so cool, Pop and the dutch masters unite for ice cream! I love it! Wow! This sounds unbelievable! Definitely trying this!! These are great, fun cones. Perfect for a small snack. The ice cream looks delicious. I want to use that photo as my mobile background. Are you okay? That’s the most beautiful photos i’ve ever seen. that chocolate is one of the favorite me..